“Fermilab’s neutrino experiment, MicroBooNE, is beginning the full construction phase for the detector, after DOE announced the official Critical Decision 3b approval on March 29. ‘This is a significant milestone for the MicroBooNE project,’ said project manager Gina Rameika, noting that the next step in the DOE CD process will be CD 4, which is approval to start operations, planned for mid-2014. In the last phase of the project, the MicroBooNE collaboration began acquiring precision-made parts for the detector from institutions like Brookhaven National Laboratory, Syracuse University and Yale University. Soon the team will begin assembling those pieces. “Scientists recently proved possible a new way to converse when radio waves won’t do. For the first time, physicists and engineers have successfully transmitted a message using neutrinos…’It’s beginning to look more feasible,’ said electrical engineer Dan Stancil of North Carolina State University, who proposed the recent neutrino communication test as a side experiment at Fermilab’s MINERvA neutrino detector. The selected beamline design details a proton beam, above ground level, running through a hill and to a ground-level target. said Rep. Hultgren at Fermilab on underground science. “Representatives Randy Hultgren and Judy Biggert met at Fermilab on Sept. 28 to lead a discussion about the future of underground science and the Deep Underground Science and Engineering Laboratory (DUSEL). Under increasing pressure to tighten the federal budget, the Congress members asked how world-class particle physics research could be maintained, while providing the best value for taxpayers. ‘This program will bring major international participation to our shores and allow the U.S. to stay at the forefront of research in particle physics,’ said Pier Oddone, director of Fermilab. 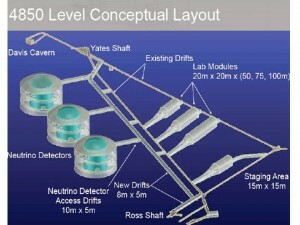 Oddone and others emphasized that the Long Baseline Neutrino Experiment (LBNE) will edge out a lead for the U.S. in the neutrino field, while taking advantage of the unique opportunity of having the perfect deep underground mine available in South Dakota. Oddone explained how LBNE will also create incentive for a new proton source, like Project X, which will effectively triple the power delivered to the experiment and keep Fermilab at the forefront of particle physics research. ‘This is the optimum site for hosting neutrino and dark matter experiments,’ said Kevin Lesko, the principal investigator of the DUSEL project. William Brinkman, director of DOE’s Office of Science, expressed support for the program but cautioned that a limited budget will dictate the outcome.